John Cage described in his interview with Richard Kostelanetz (1991) that he was moving away from his conceptual work on silence and was instead moving toward the themes and tropes of theatricality. In particular, theater in the round was a conceptual platform from which to jump: He decided against closing the audience out as with the proscenium theater in favor of an all-encompassing, interactive performance. In the proscenium theater, the interior architecture situates the audience members hierarchically and privileges the middle section over the sides. This seating arrangement positions the audience as mere observers, passive subjects of the performance. Instead, understanding theater as life, John Cage idealized each member of the audience as actor, performing composed music, talking or singing along, engaging with all five senses the environment around them. In composing what he would define as a theatrical piece, he defines theater as unrestrictedly as possible: “I would simply say that theater is something that engages the eye and the ear” (Kostelanetz 1987, 101). An untitled performance at Black Mountain College in 1952, often considered the first Happening (Fetterman 1996), represents an anticipatory move to Cage’s transformation of the audience as participators. Four non-touching, inward-facing triangles provided the stage for which the participating performers moved about the large, X-like space, while David Tudor played Water Music (Fetterman 1996). Though the actual event was to become known as a Happening, the mobilization of the audience into part of the performance—what I will call ameublement kinesthétique, allowed the performers to circumambulate and pass through the audience members, while engaging kinesthetically and at multiple levels of sensory attention. I make use of this event as a prelude to his approaching theatrical-minded performances because it demonstrates themes of interactivity and movement that become increasingly important in Cage’s later works. This piece bridges his earlier, intricate, sound-centered events, such as Imaginary Landscapes No. 1 (1939) and Sonatas and Interludes (1946-48), with carnival-like performances, notably Variations IV (1963) and Musicircus (1967). My argument is not an attempt to position his works along continua of ‘architectural’, ‘technological mediation’, or ‘audience interaction’ spectra; rather I aim to explore the multiple spatial scales at which Cage and Lejaren Hiller’s HPSCHD itself operates as per heavily mediated humanistic and technological layers at which their audience themselves performed on audio-visual, and kinetic levels. The performance at Black Mountain College helps establish the new function of audience-inclusive interior seating, but in this case, the audience is still a passive set of performance furniture—an inactive arrangement of innocuous pawns. Though Cage allotted for the maximum interactive opportunity given the untraditional seat assembly, HPSCHD was the move toward ultimate audience mobility: The performance did not center on the seating furniture and not necessarily a seated audience, though they were free to sit and absorb the images and music. Rather this structure was turned inside out, decentralizing the action into an unfocused multitude of centers at the technical and humanistic levels. This is what I mean when I call the performance ameublement kinésthetique. In Erik Satie’s musique d’ameublement, or furniture music, “furniture” is the adjective or modifier describing the music. Kyle Gann describes Erik Satie turning to Fernand Léger at a restaurant in 1919: “You know, there’s a need to create furniture music, that is to say music that would be a part of the surrounding noises that would take them into account” (Gann 2012, 75). In this case, music is the furniture in the background that socializing people are meant to ignore or to “fill up the awkward silence that occasionally descend on guests” that would “spare them of the usual banalities” (ibid.). The music furnishes the room like wallpaper. In traditional musical and dramaturgical performances, the audience is, in a sense, a metaphor for the furniture that furnishes the performance—a wallpaper of eyes, to which the performers to act or play. A half-century later, John Cage inverts this relationship, mobilizing the once immobile, furnishing audience. Instead, the furniture modifies that active environment into a feedback loop of social and kinesthetic action. In other words, the audience is the agent of the action. Ameublement, formally the seated audience, is mobilized: They are no longer passive instruments being subjected to the performance. 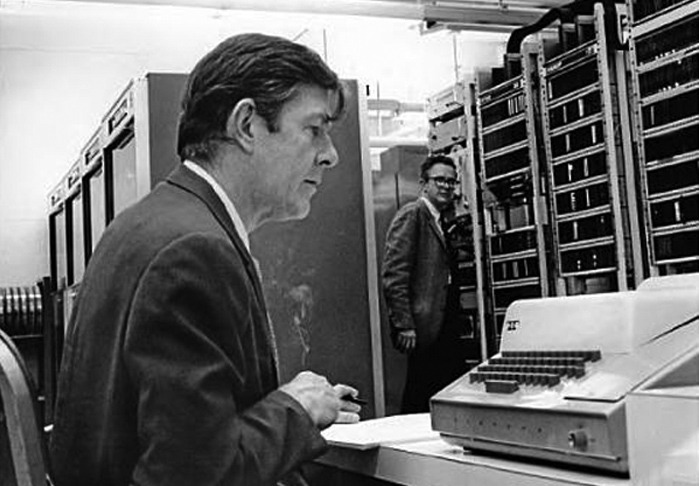 In 1967 the University of Illinois in Urbana invited John Cage as a Visiting Associate in the Center for Advanced Studies, specializing in chance procedures in the field of computer science. Already, Cage had decades of experience experimenting with new technologies. Cage’s right hand in the performance Lejaren Hiller, though having a PhD. 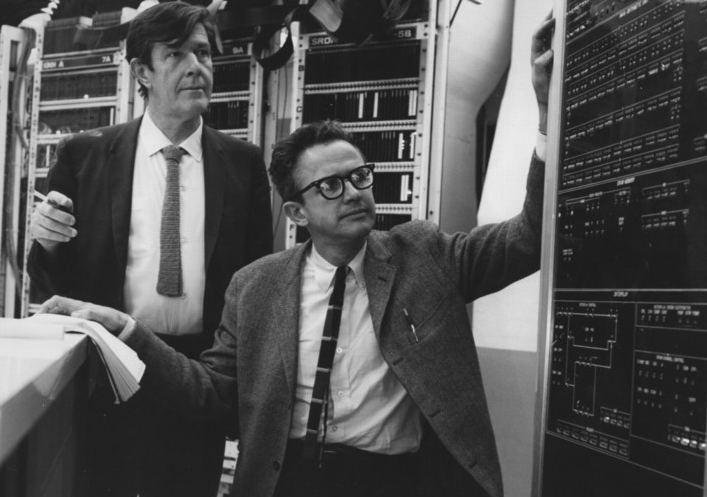 in chemistry, began studying composition under Roger Sessions and Milton Babbit, and developed the Illiad computer. After generating a suite for a string quartet, he transferred to the Music Department (Miller 2002, 163). Hiller “requested two proposals from the composer, and Cage responded with an idea for a commissioned work” (Husarik 1983, 1). Without going into detail about the actual programming and algorithmic processes conducted during their collaboration, what is important to note is that as a result of Cage and Hiller’s collaboration, three computer programs emerged, comprising the work’s official record: DICEGAME (the solos), HPSCHD (the tapes orchestra), and KNOBS (the printout for an at-home performance). In conjunction with his move toward theater, and in step with his roots in non-traditional composition, Cage found an inspiring intersection between two very traditional composers: “in Bach he found fixity and unity, with uniform motion in all parts; in Mozart he found scalar abundance and diversity—broken chord figurations, diatonic and chromatic patterns all in the same small area” (Nyman 1973, 34). In Cage’s own words: “I thought to extend this ‘moving-away-from-unity’ and ‘moving-toward-multiplicity’ and, taking advantage of the computer facility, to multiply the details and tones and durations of a piece of music” (Kostelanetz 1987, 75); DICEGAME and HPSCHD were the products of this intersection. In continuing my focus on the theoretical aspects of music and compositional theory, Michael Edwards’ “Algorithmic Composition: Computational Thinking in Music” explores the marriage between music theory and computer science in Cage and Hiller’s HPSCHD. He claims Hiller’s marriage of music and computation was largely unprecedented, though I understand the collusion of those two practices within an musical performance piece is understandable given that their function is understood through physical properties of the surrounding environment. Edwards claims, “Algorithmic composition systems cover all aesthetics and styles, with some open-ended variants offering an alternative to the fixed, never-changing compositions that for most of us define the musical limits” (Edwards 2011, 58). This is to say that the computer opens infinite possibilities for musical arrangement on the infinite parameters upon which code can be scored, given the capabilities of the medium. Further, upon these infinite and complex parameters, I maintain that the computational gestures in the making of the programs create a template upon which the animated agents (i.e., Hiller, Cage, audience members, and the computer itself) perform. In other words, reproducing an exact replica of the performance is impossible, because the computational fabric upon which the agents act is infinite. In any account, even considering Cage’s methodologies, it would be absurd to claim natural chance consulted in the computer program governs all in HPSCHD’s performance. However, given the extensive parameters at the multiple layers of mediation within this piece sociologically and audio-visually, it would be irresponsible for an analysis to exclude the inner complexity of nature peeking out from humanistic agency. Therefore, in response to Kostelanetz’s assertion of some degree of artistic agency in Cage’s work: “You’re aiming now at a purity we are never going to achieve. When we say ‘purposelessness’, we add ‘purposeful purposelessness’” (Kostelanetz 1987, 113). Though the computer removed much of the composer’s gesture in some capacity, Edwards also states, the “formalization of compositional technique in software can free the mind from musical and cultural clichés and lead to startlingly original results” (Edwards 2011, 58). The computer enables the performers and ensures their free will by faithfully supporting the underlying structure the composer designed. The computer too is a performer to which Cage delegates compositional agency and that shares the responsibility with the rest of the artists in the piece. Cage and Hiller programmed the computer to enact a coded I Ching, adding a layer of technological mediation that shares the responsibility of the other performers. The computer becomes another node of artistic agency within the performance. The harpsichordists do not chose the pieces they play (indeed, with some free will), and the audience responds to each other responding to the indeterminate array of music and visual imagery. The code provides the foundation that abolishes the agential hegemony of the hired performers in favor of a non-hierarchical network of active audience members and performers. Stephen Husarik gives a multi-sensational account of the original performance in 1969, and importantly, one of the most detailed as well. After the devastation in the editing studio, his account of the original performance becomes increasingly more significant in reproductions, such as in Dallas (1981) and New York City and The Cleveland Museum of Art (2013). In addition to the three harpsichordists on the recording, (David Tudor, Antoinette Vischer (commissioner), and Neely Bruce), four more hired players were allotted based on the predetermined quantity. These players were Yuji Takahashi, William Brooks, Ronald Peters, and Phillip Corner. They each played separate, predetermined sections of DICEGAME’s solos (Husarik 1983, 17). Husarik provides a summary of the recorded accompaniment: “Four sets of tapes for each of the fifty-two channels were spread among thirteen stations, with the instructions that they were all to be played about twice during the evening” (ibid.). In addition to the live performers, Husarik asserts Cage and organizers facilitated the handling, management, and event design for “two hundred eight tapes, eighty-four slide projectors, fifty-two tape recorders, fifty-two speakers, twelve movie projectors, amplifiers, plastic screens, slides, films, posters” and even more (ibid., 15). In what Larry Austin calls a “sonic paradox” (Austin 2004, 84), Cage forges another intersection between traditional tonality of the harpsichord and the futuristic medium of computer programming; I’d push that to include this as well: the computational and the compositional, audience sensuous interactivity and audio-visual tropes of a composed performance. HPSCHD, both the recording and the performance, emerged from a paradoxical marriage of these qualities. As for the visual imagery, the walls and ceilings served as expansive canvases of fluctuating images. Beams of light illuminated the supporting architecture, and spinning lights changed color. “In the middle of the circular sports arena were suspended several parallel sheets of visquine, each 100 by 40 feet, and from both sides were projected numerous films and slides whose collaged imagery passed through several sheets” (Kostelanetz 1970, 173). In newspaper coverage of events a week later, Thomas Willis describes the scene as “planetary.” He continues, “The 16,000-seat assembly hall here at the University of Illinois is a miniature solar system, displaying concentric promenades and long, radical aisles stretching from the central arena to the beginning of the domed roof. Suspended over the central solar floor were huge translucent plastic screens” (Willis 1969, A8). For the eighty-four slide projectors, NASA, the Wilson Observatory, and the Adler Planetarium lent Cage forty films and five thousand slides. Comprising part of the conceptual multi-spatial dynamic, space in the cosmological sense lent flickering visual images of “stars, planets, traveling through space” onto the screens, overlapping, and fluctuating, creating a “microcollage” within the already collage-esque composition winding up in the assembly hall (Husarik 1983, 11). Due to satellite and the Apollo missions, especially missions 8-10 (up to May 16, 1969 a month before the United States’ astronauts landed on the moon), images of the earth, moon, and stars on their white-speckled black backgrounds would certainly have been available and perhaps even in the collection of five thousand images NASA et al. lent to the project. And because of the wild rise of interest in scientific endeavors in the late 1960’s due to astronomical chatter in popular science news of the promised moon landing, I reason that the audience received the cosmological images with excitement and intrigue, especially given their status as curious university students. In this setting, it is likely that popular cosmological images were familiar to the students and other guests, while the possible release of more recent images would have added to the novelty of the already carnival-like scene. On the other hand, it is difficult to estimate which and what quality of photos NASA and the observatories made available to the public domain at the time of the performance. Little documentation on specific images involved is available. Although, I reason a multitude of satellite images over a decade of space exploration of stars and planets in their black backgrounds would have easily taken the five thousand slide projection slots. I expect this would have entertained the excited guests who were adding their own stars of neon face paint to the darkened, flickering room. In addition to these scientific images, The Museum of Modern Art in New York City lent Cage Méliès’s Trip to the Moon (1902), adding more imagery of humorous and lighthearted chaos. Husarik shares one of the most descriptive analyses of HPSCHD. Himself an attendant, he further unloads the multitude of description. The performance included attendants who, in their own cliques and groups, weave in and out of the larger crowd, lie down on the floor starring at the projections on the ceilings and walls, dance, and demonstrate other party or social event behavior. Free to come and go from the hall during the four-to-five hours, students and members of Greek life entered after fraternity parties and added elegant formalwear to the casual miniskirts and jeans (Willis 1969, A8). As the artistic space of the ceiling and walls opened up to the projected images, the attendants reacted to the technologically illuminated screens. The students in attendance painted their faces in neon colors that added to the spectacle and the colorful lightshow. The second-hand description of the event is overwhelming. Between production, installation, and the actual performance, it is indeed impossible to narrow down a summary of the event. But I argue that of course, this was Cage’s intention. Nyman claims that “highly ‘focussed’ listening is required,” [sic; Cage] (Nyman 1973, 34), but I maintain that focused attention in any direction is irrelevant. Though I run the risk of overly describing the event given the immense detail large and small to which Cage attended in this performance, it is impossible to describe it in its entirety; the abundance of imagery, sound, people, and action undermines a visual and acoustic center. This environment, highly technologically and socially mediated, harbored increasingly chaotic scenes as the night passed on. Guests were completely unable to focus on a singular thread of music given the seven instruments and fifty-two tape machines, or a singular image, given, to say the least, the eleven parallel screens would have made it impossible for a projected slide to stand alone for more than a moment. And the audience with neon-painted faces moved about the room, talking and dancing, more confusion ensued. I maintain that the achievement of the piece is in its dominance of every level of the observer’s sensory cortex, and each member becomes both a performer and a center of perception. If “Cage was more interested in how music was perceived than how it was conceived” (Weagel 2002, 249), the natural causal feedback loops generated during the evening through time and space clearly dominated any individual agent, computer or human. Husarik states, “the whole seemingly confused affair, probably had much in common with the world around us, and, in fact, could have been a simulated model of it” (Husarik). This is an astute observation given the conceptual theme of “space” in every facet of the performance. A neurological network of perception is at play in this case considering that unfocused, de-centered, multitude of sensory experience taking place within the brain; “The information reaching the brain from the outside world ‘is never constant; it is instead in a continual state of flux” (Onians 2007, 193). Furthermore, the networks of perception that the experience activates at a mental level are an extension of the physical movement and environment. These perceptions are, by definition, in direct response to the performance, and the audience members react to them, generating a feedback loop of action-reaction cycles with their peers in the room. After socially opening up to the sensory overload, the comingling of different groups of people became a behavioral byproduct of the ever-fluctuating environment. The technological devices were not, as Marshall McLuhan would say, “extensions of man,” (McLuhan 1964, passim) but rather in this case, the social and technological performance made the reciprocal true. Instead, the attendants were extensions of the technologically mediated performance, “each human being is at the best point for reception.” (Cage 1961, 14) and “while everyone says the same things in general, each one registered a specific experience particularly his own” (Kostelanetz 1970). “five as the most things we could perceive at once; but the way things are going recently, it may be in a sense of quantity, rather than quality, that we have our hope. When you use the word “chaos”. It means there is no chaos, because everything is equally related—there is an extremely complex interpenetration of unknowable number of centers” (Nyman 1973, 34). Husarik states: “The whole seemingly confused affair, probably had much in common with the world around us, and, in fact, could have been a simulated model of it” (Husarik 1983, 19). This is an astute observation given the conceptual theme of space in every facet of the performance. This is certainly not a paper that aims to illustrate the complexly dynamic relationships and structures that exist elaborately between the sciences and humanities, but rather an exploration within the structures pertaining to HPSCHD that, I believe, he’s contributing to as a gesture toward the natural phenomena he recognizes through Zen philosophy. It is instead a passing along of agential responsibility to each of the participating components, rather than manifesting the entire responsibilities of the master of ceremonies, composer, or artist into a single being. In doing so, a compromise allows the transference of the artistic gesture (obliterating the hegemony of the traditional artistic agent) and widens the opportunity of the natural chaotic tendencies of nature to infiltrate the process. This process, I argue, includes the audience’s mobilization due to the natural diffusion of hierarchical agency: “For all its diffusion, therefore, HPSCHD was an indubitably organic piece, where every element contributed its bit to the whole and which successfully established a unique and coherent ensemble of interrelated parts” (Kostelanetz 1970, 175). This performance likely reinforced his anarchic philosophies in that he witnessed the artistic and social behavior of a body of people when rid of their “conductor” (ibid.). When there is no conductor, and thus no center on which audience members have to rely for order and meaning, the natural course of their action is to become part of the environment of the performance. Amerublement kinesthétique, the mobilization of the audience, is the action-reaction relationship with the performers, the audience-performers and the environment around them. Even taste. Not only were sight and certainly sound integral to the performance, taste was as well: the guests were given coffee cups before the performance, unaware of the objects’ involvement in the finale. Used as ashtrays throughout the event, the cups completed their own performances when they were ritualistically filled with coffee. See: Michael Edwards “Algorithmic Composition: Computational Thinking in Music” in Communications of the ACM 54, no. 7 (2011), pages 58–67 for more information regarding the computational programming of these pieces. For example, both the programmer and the musician commit a gesture that is governed by the ontological physics of the medium. For example, a musician strikes a piano key and generates a physical environment of sound waves that resonate with the surrounding air and physical surfaces; the programmer commands the lines of code that generate an environment within the computer medium that is subject to the feedback of the code it generated. On Friday and Saturday, May 3 and 4, 2013, Darmstadt Essential Repertoire put on a performance at Eyebeam Art & Technology Center in New York City of HPSCHD. Through a video made available on YouTube, Thomasz Berezinski filmed the performance, concentrating in particular the harpsichordists, one of whom being Bruce Neely, a player at the original performance in 1969. This video documents nine minutes and twenty-six seconds of the five-hour Friday performance. Joshua White and Brock Monroe of the Joshua Light Show installed the event. After studying the video, it is apparent that there are features of the recent performance that differ from the 1969 performance descriptions: a seeming much smaller area houses the performance, giving it an air more like a gallery “walk around” rather than the “multiple centers” ambulatory space the assembly hall at Urbana would have afforded. It is unnoted if the projected images were donations from NASA et al. as projected in the original performance, but it seems the images depicting space, stars, planets, etc. were computer-generated images and/or more overly abstract than the original as well, though there do seem to be some microscopic images and less abstract images of body-like figures. In continued effort to locate documentation of the original event, Richard Kostelanetz used this contemporary performance as a platform to publicly request any documentation of the original event not destroyed by anti-university arsonists. Thus far, no one has come forward. In all, I speculate Cage would have been thrilled for Twitter’s readily available posting of the Mars Rover’s photographs from the surface of the planet. Austin, Larry. “HPSCHD by John Cage; LeJaren Hiller.” Computer Music Journal 28, no. 3 (2004): 83–85. Edwards, Michael. “Algorithmic Composition: Computational Thinking in Music.” Communications of the ACM 54, no. 7 (2011): 58–67. Fetterman, William. John Cage’s Theater Pieces: Notations and Performances (1952). New York: Routledge, 1996. Husarik, Stephen. “John Cage and LeJaren Hiller: HPSCHD, 1969.” American Music 1, no. 2 (1983): 1–21. Kostelanetz, Richard, ed. Cage. New York: Praeger Publishers, 1970. Kostelanetz, Richard. Conversing with Cage. New York: Limelight Editions, 1991. McLuhan, Marshall. Understanding Media. New York: McGraw-Hill, 1964. Metzger, Heinz-Klaus. “John Cage, or Liberated Music.” Translated by Ian Pepper. October 82 (1997): 48–61. Miller, Leta E. “Cage’s Collaborations.” In The Cambridge Companion to John Cage, 151–168. Cambridge: Cambridge University Press, 2002. Nicholls, David. “Towards Infinity: Cage in the 1950s and 1960s.” In The Cambridge Companion to John Cage, 100–108. Cambridge: Cambridge University Press, 2002. Nyman, Michael. “Cage/Cardew.” Tempo no. 107 (1973): 32–38. Weagel, Deborah, and John Cage. “Silence in John Cage and Samuel Beckett: 4’33’’ and ‘Waiting for Godot’.” Samuel Beckett Today 12 (2002): 249–262. Willis, Thomas. “A Giant Happening at the U. of I. Assembly Hall.” Chicago Tribune. May 11, 1969, sec. F9. Willis, Thomas. “The Weekend Happenings: Music Urbana Happening in Solar Setting.” Chicago Tribune. May 18, 1969, sec. A8.